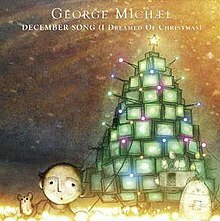 (2006) "December Song (I Dreamed of Christmas)"
"December Song (I Dreamed of Christmas)" is a Christmas single commercially released by George Michael on 14 December 2009. The track was originally announced during one of the last dates on Michael's 25 Live tour. It was available for free on George Michael's official website on 25–26 December 2008. The track was written by George Michael and longtime writing partner David Austin. During the Gerry Ryan show, David Austin confirmed that the song had originally been written with the Spice Girls in mind. After a few failed deadlines, the song was going to be given to Michael Bublé but George Michael decided to keep it for himself. The song features a sample from the Frank Sinatra recording "The Christmas Waltz". George Michael performed the song live on 13 December for the final of the 2009 series of The X Factor. The day after the performance, physical copies of the song were sold out in one day, forcing George Michael's record label to print new copies. Many fans have commented on forums of their annoyance at not being able to buy a physical copy of the single, possibly also giving the song a lower chart position than its true potential. The song debuted at number fourteen on the UK Singles Chart. The accompanying music video was Michael's second animated one, with 2002's "Shoot the Dog" being the first. The video featured Michael as a boy, and it shows his view of Christmas from a child's perspective; shown by the visualization of sunshine, lightbulbs, and motherly love. The first commercial release was in 2009, with two releases following in 2010 and 2011, the latter being the first to be released on iTunes (which excluded the video). The limited editions of the 2009 and 2010 CD releases included a Christmas card. ^ "Austriancharts.at – George Michael – December Song (I Dreamed of Christmas)" (in German). Ö3 Austria Top 40. Retrieved 25 December 2009. ^ "Ultratop.be – George Michael – December Song (I Dreamed of Christmas)" (in French). Ultratip. Retrieved 2 January 2010. ^ "Hits of the World" (PDF). Billboard. 9 January 2010. Retrieved 9 January 2010. ^ "Offiziellecharts.de – George Michael – December Song (I Dreamed of Christmas)". GfK Entertainment Charts. Retrieved 25 December 2009. ^ "Chart Track: Week 51, 2009". Irish Singles Chart. Retrieved 17 December 2009. ^ "Dutchcharts.nl – George Michael – December Song (I Dreamed of Christmas)" (in Dutch). Single Top 100. Retrieved 26 December 2009. ^ "Official Scottish Singles Sales Chart Top 100". Official Charts Company. Retrieved 20 December 2009. ^ "Swedishcharts.com – George Michael – December Song (I Dreamed of Christmas)". Singles Top 100. Retrieved 25 December 2009. ^ "George Michael: Artist Chart History". Official Charts Company. Retrieved 26 December 2009.